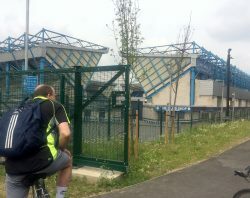 then south to Millwall Stadium where we noted the new path branching off to the right, part of Quietway 1 (photo). Continued to Nunhead Green via Bridgehouse Meadows and Queens Road station. Stopped briefly at The Green, next to the Old Nuns Head pub (see heading photo). The Green is the new Nunhead Community Centre where Southwark Cyclists are currently holding their monthly meetings (every 2nd Wednesday, 6.30-8). From Nunhead we headed uphill to Peckham Rye Park, then the long haul up Friern Road and then down to Dulwich Park. Everyone pretty warm by now, so layers being shed all round. 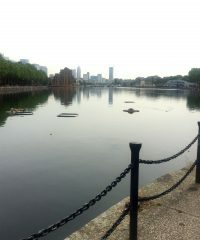 A brief “comfort” break at the Pavilion Cafe, then back on the bikes and down to Peckham Square via Crystal Palace Rd and Rye Lane. This, like Dulwich Park Cafe, is one of our regular start locations for Healthy Rides. From Peckham down a familiar route via the Canal Path, the Blue and Southwark Park. Diverted slightly at the roundabout at Galleywall Rd where there are awkward temporary lights. Back a few minutes after 12 noon having completed 10.5 miles. Thanks to Natalie for the photos. Next ride: 9.30am to 1pm, Saturday June 18th, start/finish at Pavilion Cafe, Dulwich Park.